During his twenty years as abbot of the Yorkshire monastery of Rievaulx, Aelred preached many sermons: to his own monks, in other monasteries, and at significant gatherings outside the cloister. 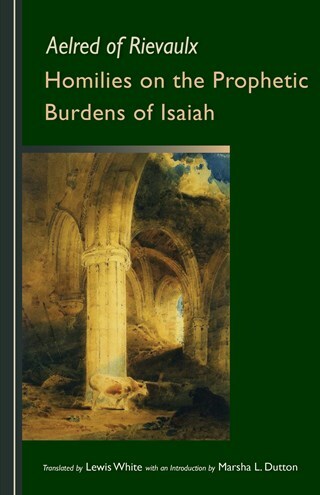 In these thirty-one homilies on Isaiah 13-16, together with an introductory Advent sermon, Aelred interprets the burdens that Isaiah prophesied against the nations according to their literal, allegorical, and moral senses. He sees these burdens as playing a role both in the history of the church and in the progress of the individual soul. This collection of homilies is an ambitious, unified work of a mature monk, synthesizing biblical exegesis, ascetical teaching, spiritual exhortation, and a theory of history. Lewis White has been a teacher and translator at the Language Center of the Universidad Tecnológica de la Mixteca, Huajuapan de León, Oaxaca, Mexico, since 2009. He was a member of Holy Cross Abbey in Berryville, Virginia, from 2002-2009.